I had the privilege of spending a couple of evenings in Parliament this week, including Wednesday evening, after David Cameron’s announcement – and apology – on the ‘Francis Report’ into the disastrous failings at Mid Staffs NHS Trust. The question a number were asking was: ‘Why didn’t Cameron go for the throat?’ There was, rightly, a sense of dismay on the part of Labour MPs that Mid Staffs ‘happened on our watch’ – but there was also a puzzlement about the apparent humility of Mr Cameron’s speech. David Cameron and his government are not exactly strangers to finger-pointing, or to attempts to use past events to undermine their opponents. Even when it’s completely unfounded and they supported the measures that led to it, they’ve shown neither shame nor hesitation about using something to hammer the Labour party in the eyes of voters. The constant ‘inherited mess’ accusation that is trotted out routinely in every interview or Prime Minister’s Questions is the classic case in point. The previous Government commissioned the first report from Robert Francis. When he saw that report, the former Secretary of State—now the shadow Health Secretary, the right hon. Member for Leigh (Andy Burnham)—was right to apologise for what went wrong. I would like to go further as Prime Minister and apologise to the families of all those who have suffered for the way the system allowed this horrific abuse to go unchecked and unchallenged for so long. On behalf of the Government—and, indeed, our country—I am truly sorry. But not a word of attack on Labour. I have no reason to doubt that the Prime Minister’s regret about deaths at Mid Staffs was genuine – but the lack of attack was out of character in a way that goes beyond mere political astuteness dictating that it wasn’t the right moment for an attack. There were other reasons that he chose the approach he did – reasons that should worry anyone who truly cares about the NHS. I believe Robert Francis’ introductory letter to the Health Secretary as part of his report holds part of the key to the Prime Minister’s stance – and some elements of this letter were touched on in Mr Cameron’s own speech. 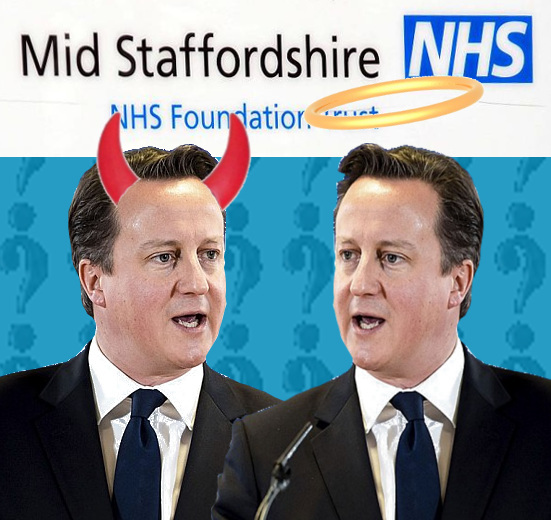 These key phrases and passages were written about Mid Staffs and its board in particular – but they apply equally or even more to this government’s policies and actions on the NHS as a whole. This was primarily caused by a serious failure on the part of a provider Trust board. It did not listen sufficiently to its patients and staff or ensure the correction of deficiencies brought to the Trust’s attention. Just like the Mid Staff’s board, the government has consistently failed to listen to key people if they were not saying what it wanted to hear. From its very inception, the government’s Health and Social Care Act was vehemently opposed by almost every body of health professionals. Yet it pressed ahead regardless – clearly following another, less public agenda. The RCN and unions have repeatedly called the government’s attention to the increasing pressures on staff caused by short-staffing, and the risks to patients that it presents – yet nurse numbers have consistently reduced over the course of this government, with over 7,000 nurses lost. Most recently, the people of Lewisham have protested vigorously against the downgrading of their local hospital because of problems at a completely separate Trust. Local clinicians agreed that the facilities were vital to the wellbeing of the people they served. The government’s response? Find other clinicians to agree with its plans and plough ahead regardless, even though there are more than enough funds to solve South London Health Trust’s problems many times over without any need to touch Lewisham’s services. Again, there’s clearly another agenda the government finds more compelling than the wishes of patients and clinicians. An institutional culture which ascribed more weight to positive information about the service than to information capable of implying cause for concern. EM: First of all, there are 7,000 fewer nurses in the NHS than when the Prime Minister came to power, according to the figures published this morning..the president of the Royal College of Ophthalmologists said recently..“Half of health commissioners are restricting access to cataract surgery..Can the Prime Minister tell me why, for the first time in six years, the number of cataract operations actually fell last year? DC: What I can tell the right hon. Gentleman is that, under this Government, the number of doctors is up, the number of operations is up, waiting lists are down and waiting times are down. Confronted by uncomfortable facts, Mr Cameron chose not to address the issues raised, but to cherry-pick a couple of points on which he could say something positive. And even those were wrong – in September 2012, the number of people on NHS waiting lists was the highest since 2008. ‘Corporate’ here doesn’t mean to do with businesses, but the collective memory, experience and expertise of a hospital or the NHS as a whole – which means that lessons learned in one part, or in one period, can be of benefit in another. Robert Francis found that this applied to Mid Staffs. But the government’s own risk assessment – which it fought hard to avoid releasing and only disclosed in a redacted form – said that the introduction of the Health and Social Care Act would lead to fragmentation and loss of clarity. Yet it was forced through anyway, in complete disregard of its own warnings. The process of allowing ‘any qualified provider’ to bid for NHS service provision inevitably leads to greater and greater fragmentation of the NHS – and this fragmentation will cost lives because of the lost collective memory, and the inherently less efficient communication among disparate organisations. But there’s profit in it, and that’s apparently enough justification for the Tory-led coalition. Which leads us to the next failing highlighted by Francis’ introductory letter. closure of Accident & Emergency departments in spite of the known risks of delay in receiving urgent treatment during the ‘golden hour’ (a term emphasising the importance of high-quality intervention as soon as possible after trauma). and many other consequences which cannot in any way be said to be in the best interests of patients. As Mr Francis points out, as well as financial goals and national targets, one of the key things which distracted the management of Mid Staffs from its primary task of providing high-quality healthcare was the push to achieve ‘foundation trust’ status – semi-autonomy from the national structures governing ordinary NHS trusts. The Health & Social Care Act 2012, which the Tories forced through Parliament last March in spite of massive opposition from professionals, public and Labour politicians, requires every NHS Trust to achieve foundation status by no later than April 2014. There is no realistic doubt that this imperative has been distracting the executives and managers of other Trusts since the Act became law. The essential aims of what I have suggested [include]:.. Ensure openness, transparency and candour throughout the system about matters of concern. On the basis of these figures, we would conclude that expenditure on the NHS in real terms was lower in 2011-12 than it was in 2009-10. It will improve the quality of care the NHS delivers while making up to £20billion of efficiency savings by 2014-15, which will be reinvested in frontline care. £1.4 billion of NHS surplus was clawed back by HM Treasury. No one trusts the Treasury and we have already seen it steal carry forward money built up to help the NHS over the years ahead. The government’s culpability and ‘form’ in all the areas condemned by the Francis Report explains why Cameron and his government have been so apparently humble and careful in their statements about Mid Staffs – why they haven’t chosen to use the Francis Report as a club to try to beat Labour over the head in front of voters. That and the fact that another 5 Trusts are to be investigated for similar warning scores to those that flagged Mid Staffs as a problem. If the Tories tried to do so, it would be a straightforward matter for Ed Miliband and his health ministers to show how the failings in a single Trust under have been copied, propagated and worsened by the Tories – and, given the time the investigations into the 5 other Trusts will take, the results of those will come out just ahead of the next General Election, the worst possible time for Tory electoral hopes. So it makes tactical sense for Cameron to play it humble for now. However, I don’t believe that’s all there is to it – and if I’m right we have cause for concern. The Tories are not known for letting an opportunity for some posturing to pass by, even if its wisdom is obviously questionable. So there’s another agenda here. I believe the answer to that question lies in Jeremy Hunt’s recent decision to downgrade services in Lewisham because of financial problems in a neighbouring Trust. While he could have decided to set a common-sense precedent that funds from across the NHS can be used to rescue struggling Trusts, Mr Hunt instead chose to set another: that successful, well-run Trusts can be carved up to rescue their struggling neighbours. I believe that this methodology now represents a Tory ‘plan A’ – one which means that they can afford to be very cautious and careful about their previous modus operandi of starving Trusts of funds, resources and staff. They won’t give up on that tack – but they can be circumspect about it, because when they need to ‘lie low’ on that, they can press ahead with closures and downgrades anyway. For all Mr Cameron’s words about treasuring the NHS and wanting the best for it, the evidence suggests otherwise – and that serious concerns should be entertained about his current, seemingly-modified stance.